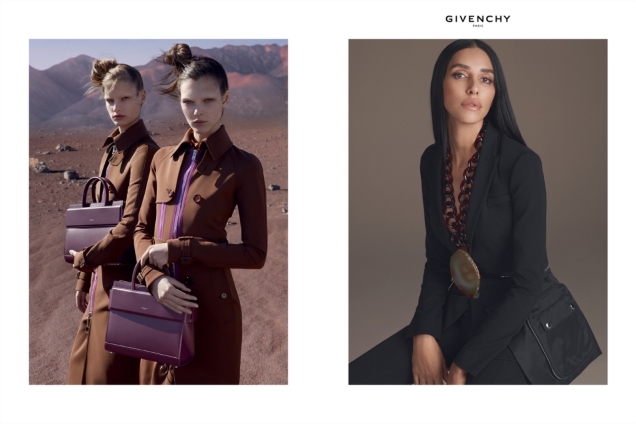 Have we finally seen the last of Riccardo Tisci’s overcrowded advertising campaigns for Givenchy? It seems the designer has broken free from the theme of previous ads featuring the Givenchy #gang roaming the streets of New York with a welcome new concept for Spring 2017. Though the ads have a new look, Tisci stays true to his usual muses, including Irina Shayk, Vittoria Ceretti, Faretta and Lea T, photographed by Givenchy regulars Mert Alas and Marcus Piggott. Members of our forums were quick to kickoff a debate. “Not liking the studio portraits but that has more to do with Irina. The whole campaign should have been the location shoot. Looks like they are on Mars and that’s not a bad thing considering where the planet is headed. Guess Givenchy is positioning itself for high fashion space travel?” zoom commented straight away. “Once again, fashion can’t help itself and it has to have multi-concept campaigns. Stick to one idea, please. The location shots are decent enough…the men’s is particularly nice (the clothes themselves are a different story, blegh!) The studio shots are heinous and horrifyingly over-Photoshopped. Really bad,” added dior_couture1245. Feeling the same way was anlabe32. “I like it. The location shots are great and the girls look amazing in their portraits. However, they should try to do something completely new next season. Not gonna happen though,” she stated. “Agreed about the location shots, it’s easily the best I’ve seen from M&M in a while. The styling looks a bit glorified air hostess, but I love it. Can’t stand the studio girls, and quite frankly could’ve done without them, especially Irina. She always looks so vulgar,” slated Benn98. Are you feeling it? Add your own two cents along with everyone else here.